Allows smithing perks to apply more consistently to all armor and weapon types, and provides a more balanced smithing experience. Thank you to Incata for modifying and providing the New Perk Tree #2 version. Thank you to TechAngel85 for updating and fixing the Fomod installer. Added a check to make sure the global variables would get set correctly. Added "Allow repeated stages" flag to the SPOInit quest. Fixed condition on smithing perks that would have resulted in the tempering bonus not applying properly to a couple of items, such as the Shield of Solitude. This change affects the Improved Vanilla and Modified Vanilla Trees only. No changes were made to the New Perk Tree options. Corrected a few bugs in New Perk Tree #3. Conditions should now work properly and apply the correct values. Added New Perk Tree #3 option. Needed to make a small edit to the installer script to make sure the correct file was getting properly installed. Changes to individual perks moved to Weapons & Armor Fixes to simplify compatibility and allow support for different DLC combinations. Added MODIFIED VANILLA perk tree option. VANILLA TREES: renamed Orcish perk "Advanced Heavy" and moved Advanced heavy armors to use this perk. NEW TREES: Renamed Elven Smithing "Elvish Smithing"; renamed Dragon & Daedric Smithing to Mythic Smithing. NEW TREES: Should now work with the Dragonborn Black Book perk reset feature. 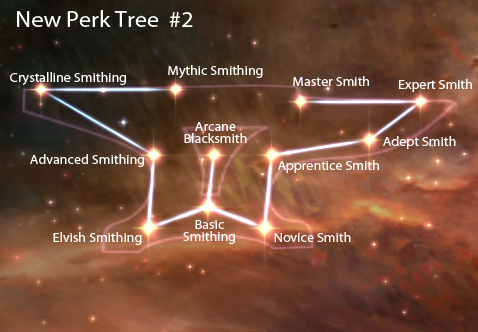 NEW PERK TREE #2: Fixed a couple of conditions on the Expert Smith & Master Smith perks. Added new keywords that will support future features in CCO. Added optional New Perk Tree #2. Corrected error that was allowing Vampire armor to be over-improved. Corrected error that was allowing Elven Gilded items to be over-improved. Corrected a mistake where I included the wrong file in version 2.0. Updated compatibility with Weapons & Armor Fixes. Carried over a change from the Unofficial Dawnguard Patch that was previously missed. Removed minor change that needs to be in Weapons & Armor Fixes rather than this mod (does not affect the function of this mod in any way). This mod started out with the intention to simply change the smithing perks to apply more consistently to all armor and weapon types. However, with the addition of the new perk trees and perk arrangements, I feel that this mod succeeds in providing a much more balanced smithing experience with better perk choices and more logical perk progression. The official 1.9 update or higher is required for all versions. In order for this mod to function correctly, you also need to install Weapons & Armor Fixes Remade and Complete Crafting Overhaul Remade. Download the all-in-one installer and follow the installation options to select the perk tree you want. Load Smithing Perks Overhaul AFTER Weapons & Armor Fixes, Complete Crafting Overhaul, aMidianBorn Content Addon, and Immersive Armors. It is recommended that you install this mod on a new game, especially if you choose one of the New Perk Tree options. 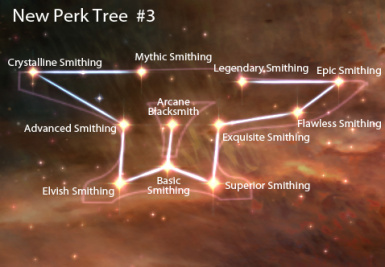 If you choose to install one of the New Perk Tree versions on an existing game, then upon first loading your game, any current smithing perks (except Basic Smithing and Arcane Blacksmith) will be removed and you will be given the equivalent number of perk points to redistribute as you see fit. You must have SKSE installed for this to work. If you don't have SKSE installed, then you will have to use the console to add/remove perks. This mod will be incompatible with any mod that alters the Smithing Perk tree. This mod should be fully compatible with mods that add new weapons or armors. and consistency of the perks as they are applied in the game. Please use Weapons & Armor Fixes Remade to correct any bugs in the "MaterialType" keywords used on weapons and armor. Complete Crafting Overhaul Remade can be used to add the missing crafting and tempering recipes. There are 5 different perk tree options for you to choose from. Simply choose whichever one you prefer. 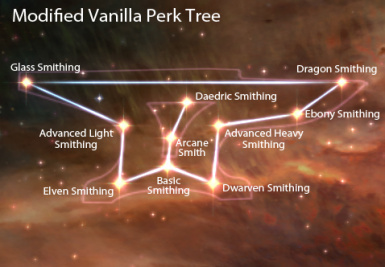 The first two perk tree options stick with the light/heavy division of the vanilla smithing tree, but they attempt to make the perks apply more consistently to items in the game. 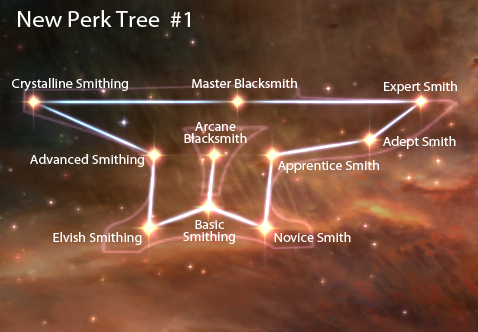 Both trees also adjust the shape of the perk tree to better fit the shape of the constellation. IMPROVED VANILLA TREE - Orcish Smithing has been renamed "Advanced Heavy Smithing" and will now allow you to further improve Steel Plate armor, Honed Draugr weapons, Blades armor and weapons, Nordic armor and weapons, and Chitin Heavy armor. In the vanilla game, these items were instead affected by the Advanced Smithing perk on the light side of the tree. MODIFIED VANILLA TREE - Includes the changes from the Improved Vanilla Tree, but also removes the Daedric Smithing perk from the heavy branch of the tree and instead adds it as a branch off of the Arcane Blacksmith perk. Daedric Smithing now requires having both the Arcane Smithing and Ebony Smithing perk. 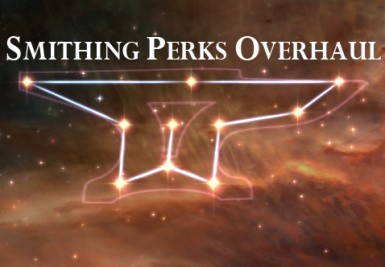 This resolves the inconsistency in the perk progression from daedric to dragon and allows the player, if they wish, to pursue only one of these high level perks. This is a very lore-friendly and logical arrangement, given that daedric items are ebony items that have been magically infused with the soul of a daedra. This arrangement can also help to enhance roleplaying options for "good" characters who might wish to avoid all association with daedric items. I never felt that the light/heavy division of the vanilla perk tree worked very well. Weapons don't follow the light/heavy divide, and light armored characters are forced to invest perks in both sides of the tree in order to craft many of the better weapons. Of course, as discussed above, the vanilla game and DLCs also mess up this division so it isn't even applied consistently. Why is Steel Plate armor, Nordic armor, and Chitin Heavy armor all on the light side of the tree while Stalhrim Light armor is on the heavy side? 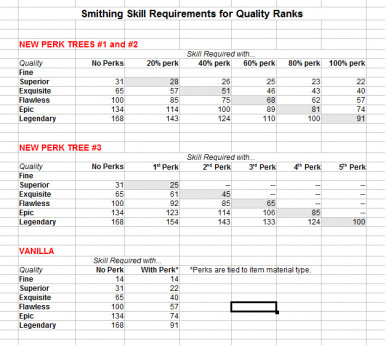 This sort of flip-flopping and inconsistency leads to confusion and makes it hard to maximize the effectiveness of the perk points that are invested in Smithing. The second major problem with the way the vanilla smithing perks work is that they tend to create imbalances among different grades of equipment. So lower-leveled weapons and armor will often be better than higher-leveled items until you take additional perks and can further improve the higher-leveled items. To address these issues I've done away with the light/heavy divide in the perks and instead divided the perk tree between Crafting and Improving. Crafting perks allow you to create new types of weapons and armors, but they won't alter the amount to which you can improve those items. Improvement perks apply to all items and will gradually scale your ability to improve items with each additional perk. This also eliminates the guess-work involved in trying to figure out which perks allow you to temper your unique items and artifacts. Now they'll simply use the same scaled improvement perks as every other item. This makes crafting and improving items much more consistent than the vanilla perk structure. NEW PERK TREE #1 - Has 10 perks (the same number as the vanilla perk tree). In this version, the final "Master Smith" perk has combined benefits, but it requires that you complete both branches of the perk tree to fully unlock both parts of the perk. ﻿Basic Smithing: Same as Steel Smithing without the improvement bonus. Elvish Smithing: Allows you to create Elven, Dwarven, and Chitin items. Advanced Smithing: Allows you to create Scaled, Steel Plate, Orcish, and Nordic items. Crystalline Smithing: Allows you to create Glass, Ebony, and Stalhrim items. Novice Smith: Improve all items 20% more. Apprentice Smith: Improve all items 40% more. Adept Smith: Improve all items 60% more. Expert Smith: Improve all items 80% more. Master Smith: Allows you to create Daedric and Dragon items. This perk requires the Crystalline Smithing perk (you can't get it simply by going up the "improvement" side of the perk tree). This perk also allows you to improve all items twice as much...however this part of the perk requires that you also have the Expert Smith perk. So in order to get the perk itself, you must complete the Crafting side of the tree. But if you complete both sides of the tree, you'll get the additional effect from this perk. NEW PERK TREE #2 - Has 11 perks (one more than the vanilla perk tree). This version splits the Master perk into both a crafting (Mythic Smithing) and an improvement perk (Master Smith). Mythic Smithing: Allows you to create Daedric and Dragon items. Master Smith: Improve all items 100% more. NEW PERK TREE #3 - Has the same number and arrangement of perks that is featured in New Perk Tree #2. However, the way the improvement perks work has been altered. The fractional (less than 100%) improvement bonuses used by the new perk trees can create a situation where the player takes a perk but still doesn't have the skill level necessary to reach a higher quality rank, and therefore they don't see any immediate benefit from having taken the improvement perk. Rather than having set percentage bonuses, the improvement perks in New Perk Tree #3 have values that have been calculated to correspond to the quality tiers. So taking Superior Improvement will mean that you will be able to improve items to superior quality (assuming you don't have any other smithing debuffs or modifiers in effect). The perks aren't required to achieve the higher quality tiers; however, like the original perks, they will lower the skill level required to reach the higher quality ranks. Basic Smithing: Same as Steel Smithing without the improvement bonus. Superior Smithing: Improve all items to Superior quality or higher. Exquisite Smithing: Improve all items to Exquisite quality or higher. Flawless Smithing: Improve all items to Flawless quality or higher. Epic Smithing: Improve all items to Epic quality or higher. Legendary Smithing: Improve all items to Legendary quality.